So far, the link between debt repayment and GDP has been limited to a mechanism that is like a 'better fortunes' clause. Investors accept a sovereign debt restructuring, while hoping to benefit from higher yields if the situation in the country improves. As such, warrants linked to real growth have been widely used in some major sovereign debt restructuring since the 1990s (Argentina, Greece and Ukraine). To date, however, no GDP-index bond has yet been issued on financial markets. Bonds indexed to GDP in current value can be used as an instrument for lowering the default risk and preventing potentially costly debt restructuring by stabilising the debt-to-GDP ratio (Shiller 1993, Barro 1995, Borensztein and Mauro 2004, Barr et al. 2014). The interest rate is not indexed itself on nominal GDP. The general debt dynamics depend on the interest burden and the primary balance. If all the debt is indexed to GDP, the impact of GDP shocks is mechanically removed from the debt dynamics. 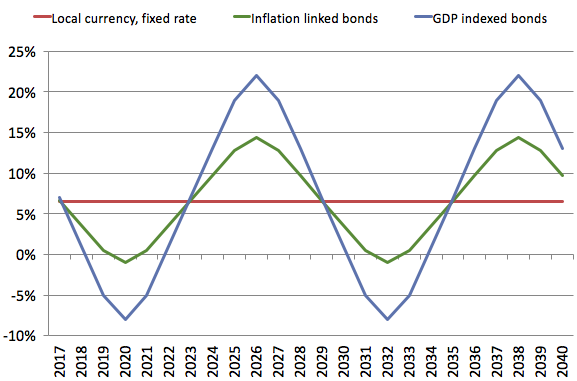 Figures 1 and 2 below illustrate that issuing the whole debt as GDP-indexed bonds mechanically would allow a full stabilisation of the debt ratio over the cycle. Investors would bear the nominal cyclical risk and the default risk would be reduced, which improves long-term solvency. The countries in which the gains related to the use of GDP-indexed bonds rather than conventional debt, both in foreign and local currencies, are the highest were identified by simulation results. We quantified these gains in terms of debt-to-GDP ratio for the 95th percentiles, that is, the 5% least-favourable debt paths by 2040, as compared to simulations with conventional bonds in both local and foreign currencies. The gains were broken down by sources: issuance in local currency, indexation to inflation, and indexation to real growth. We also selected countries with a minimum size of sovereign debt market, and with enough credibility to issue reliable GDP figures. 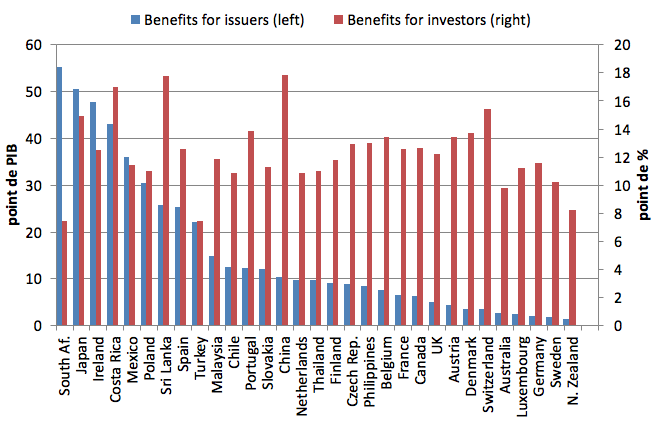 Based on these criteria, 33 countries would benefit from issuing GDP-indexed bonds. 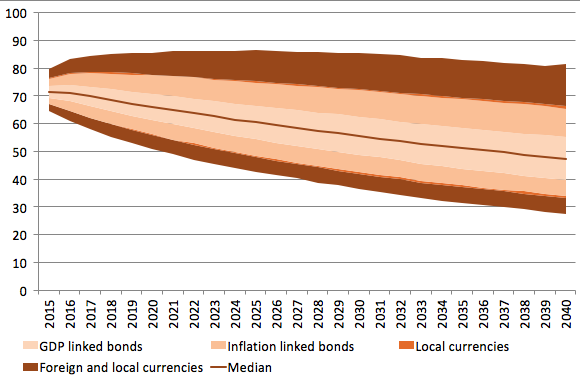 Figure 3 depicts the reduction in volatility that would result from the replacement of conventional bonds by other bonds in local currency only, when indexed to inflation, and when indexed to GDP. For Costa Rica and Sri Lanka, which issue a large part of their debt in foreign currencies, the gains associated with issuing bonds only in local currency would be substantial, and are not necessarily separable from GDP-indexed bonds. 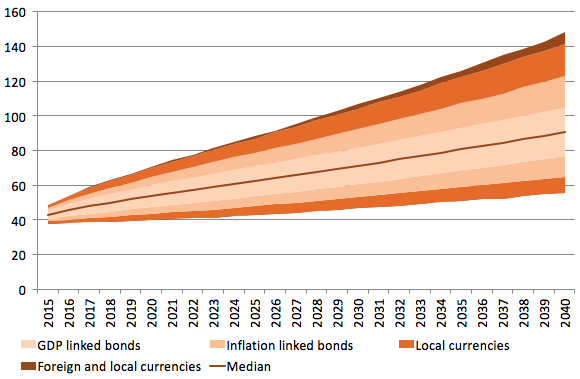 Indeed, the use of GDP-indexed bonds allows the country to issue bonds in local currency, since indexation to nominal GDP would partly cover the currency risk, as shown in Figure 4. This alleviates what Eichengreen and Hausmann (1999) described as the ‘original sin’ – a situation in which the domestic currency cannot be used to borrow long term. Notes: The orange areas show the gap between the 5th and the 95th percentiles of simulations. The curve shows the median for 10,000 draws based on the variance-covariance matrix (see Cabrillac et al. 2017 for the methodology). GDP-indexed bonds may attract new investors because of the automatic partial long-run currency risk hedging they provide, as this hedging is not available in most emerging currency markets. 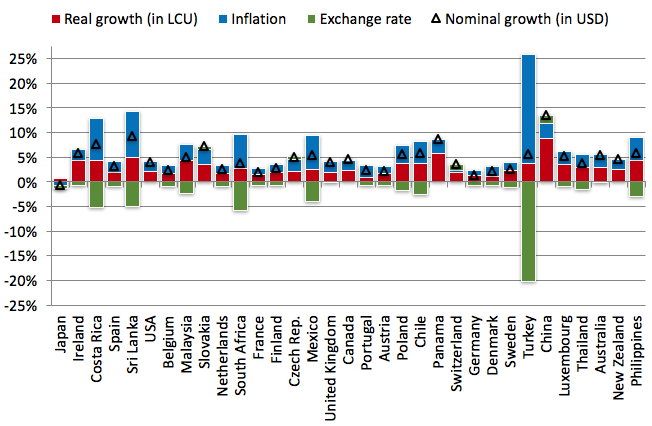 Nominal exchange rate and nominal growth influence each other. Average nominal growth in a US dollar breakdown for the 33 selected countries above is useful to identify the main source of gains from GDP-indexed bonds (Figure 4). For all countries (except Japan) this average gain would be positive, and nominal growth gains more than compensate for exchange rate changes. Source: IMF World Economic Outlook, April 2016. In addition, GDP-indexed bonds present an opportunity for portfolio diversification. The estimated gains from portfolio diversification were calculated for an investor willing to diversify a reference portfolio by investing in one of the countries previously selected. Our results suggest higher gains from diversification through GDP-indexed bonds than diversification through equities if we start from a reference portfolio. This is due to a lower variance of nominal GDP growth than the variance of stock returns, and a lower correlation of nominal GDP growth with the initial portfolio. Figure 5 summarises the gains for both issuers and investors. The debt-to-GDP ratio would decline by 15% on average with the issuance of GDP-indexed bonds over a 25-year horizon for the 5% least favourable debt paths. The volatility of the reference portfolio potentially would decrease by 12% on average for a diversification through investment in GDP-indexed bonds rather than in equities for a given country. Notes: Gains for the issuing country: Decrease in the debt-to-GDP ratio resulting from the issuance of GDP-indexed bonds over a 25-year horizon for the 5% least favourable public debt paths. Gains for the investors: Average potential decrease in the volatility of the reference portfolio (80% US equities, 20% T-bills) for a diversification through investment in GDP-indexed bonds rather than in equities for a given country. Efficiently diversify their portfolio compared to equity. The contribution of GDP-indexed bonds to a public global good (international financial stability) would justify international coordination, including by regulation authorities, to address the obstacles to the development of such bonds and to promote their use. Since the benefits for the issuer depend on the volume issued, it is essential to achieve a critical size and enough issuers to reduce the liquidity premium. Establishing a term sheet for a simple product would reduce the novelty premium. Moreover, the international community could set a framework to assess data reliability and avoid the risk of moral hazard. Finally, GDP-indexed bonds could include specific collective action clauses because of their automatic adjustment mechanism, and prudential regulation could consider the fact that the default risk on GDP-indexed bonds is lower. Barr, D, O Bush and A Pienkowski (2014) “GDP-linked bonds and sovereign default”, Bank of England Working Paper, No. 484, January. Barro, R J (1995) “Optimal debt management”, National Bureau of Economic Research, Working Paper, No. 5327, October. Benford, J, T Best and M Joy (2016) “Sovereign GDP-linked bonds”, Bank of England, Financial Paper, No. 39, September. Blanchard, O, P Mauro and J Acalin (2016) “The case for growth indexed bonds in advanced economies”, Peterson Institute for International Economics, Policy Brief, No. 16-2, February. 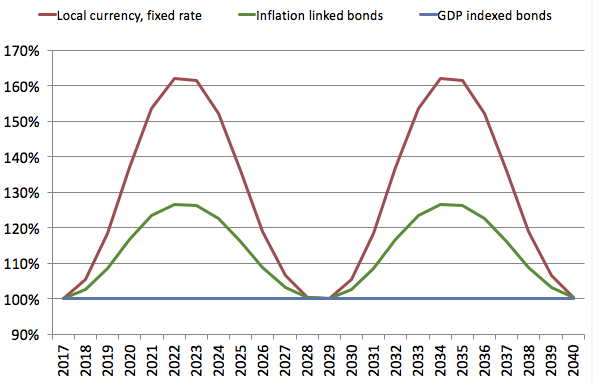 Borensztein, E and P Mauro (2004) “The case for GDP indexed bonds”, Economic Policy 19. Cabrillac, B, L Gauvin and J-B Gossé (2017) “GDP-Indexed Bonds: what are the benefits for issuing countries, investors and international financial stability?”, Quarterly selection of articles - Bulletin de la Banque de France 44. Eichengreen, B and R Hausmann (1999) “Exchange rates and financial fragility”, NBER Working Paper No. 7418, November. Shiller, R J (1993) Macro markets: creating institutions for managing society’s largest economic risks, Oxford University Press. We used the methodology developed by Blanchard et al. (2016) and Benford et al. (2016) to simulate debt dynamics from 2015 to 2040. The investor initially holds a portfolio of US stock and T-bills and is looking to decrease the variance and/or increase its Sharpe ratio through diversification. Impact on the Sharpe ratio is discussed in Cabrillac et al. (2017).